With Used Filter Presses fluids are cleaned and solids are separated from liquids. Used Filter Presses are discontinuous pressure filters, they are reliable and robust in many different applications. With great success they are used in many different industries. This used dewatering technology mainly comes from municipal waste water and industrial sludge dewatering. 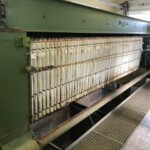 The Used Filter Presses are in good used condition. Some of them have already been dismantled and are stored. 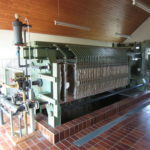 But often the used filter presses are still in operation and can be viewed at the customer site. The industrial filter presses differ in the type of built. The so-called Over-Head construction and Side-Beam construction. Furthermore, another distinction is the type of filter plates that are being used, the so-called Chamber Filter Plates or Membrane Filter Plates. Each Chamber Filter Press has a different number of filter plates. The cake thickness results from the respective adjacent recessed filter plate. The filter plates are enclosed with a filter fabric. They are compressed and sealed by means of hydraulic high pressure of 200 – 400 bar. Special pumps then push the medium to be separated, with a pressure of 6 bar to 30 bar, in the filter. The solid cake remains in the space, and the liquid runs out through holes in the plates of the filter. It is used for the filtration of suspensions with high solids content. This form is most commonly used. The Membrane Filter Press is constructed as a Chamber Filter Press, but is characterized in that one or both sides of the chamber is formed with a movable diaphragm. Thus, the cake may be pressed additionally after filtration. It is used for the filtration of suspensions in order to achieve the highest dry matter concentration in the filter cake and faster compression times. This stands out as a great advantage over the Chamber Filter Press. However, it is also technically extensive and thus more expensive to purchase and operate. 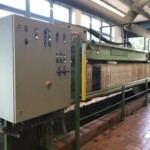 The Belt Filter Press, or Filter press for sludge dewatering is a continuous pressure filter with filtering cloth as filter medium, in which the flow process takes place in two stages. 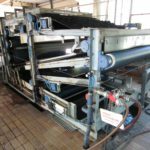 The first phase is a gravity filtration and the second step is the pressing of the pre-dewatered sludge between two mesh belts, which are guided by rollers. 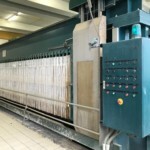 The Belt Filter Press is often found in the textile, paper making and sewage application. However, the achieved dry matter values are much lower than in the Chamber Filter Press. 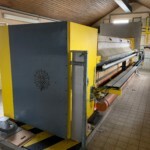 Please contact us at if you can not find the right Used Filter Presses.